Police have criticised a driver who left children "hysterical with fear" after she ran out of fuel on a stretch of motorway with no hard shoulder. 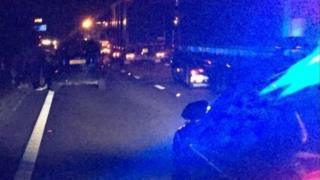 The family came to a stop at 05:25 BST on Wednesday on the M1 northbound carriageway, near the Tibshelf services in Derbyshire, where police say she could have refuelled. Officers said the "unacceptable" situation led to two near misses. The driver was reported for driving without due care and attention. A Highways England spokeswoman said their traffic officers dealt with more than 85,000 breakdowns every year on the roads they patrol. She added: "In the last two years, over 40 per cent of these breakdowns were caused by vehicles running out of fuel, tyre maintenance, power loss and engine trouble." A Derbyshire police spokesman said anyone driving on a motorway must make sure their vehicle has enough fuel to complete their journey safely. He said: "Motorways are obviously high volume, high speed roads and the risks posed by coming to an avoidable stop are huge. "The vehicle in this case ran out of fuel just past Tibshelf service station, which would have provided an opportunity for the driver to refill their tank with enough to get safely off the motorway. "Luckily there were no injuries but the potential for a serious collision was clear." Highways England advises all drivers to have a breakdown insurance policy and keep the details of this with you in your vehicle at all times.